Interest : Most interesting at 10-15m. Not interesting below 20m. 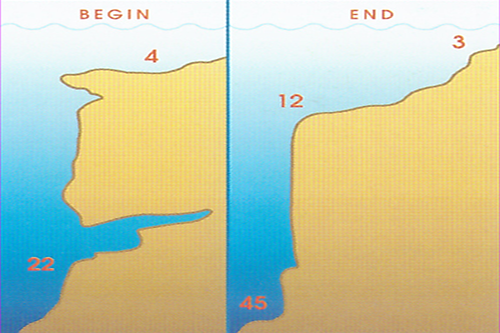 Dive Direction : Start the dive with the slope on the left shoulder, going north-east. 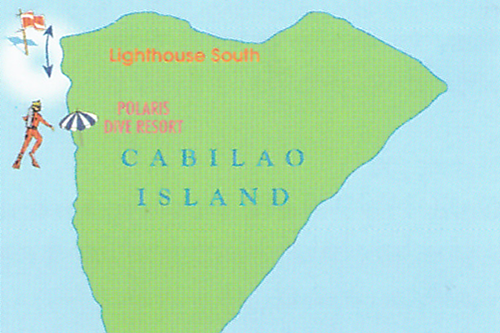 Entry Point is on the south side of the Cambaquiz beach and exit point is before the concrete pier. Nice steep slope with wall cuts and a sharp vertical wall corner. Only a few corals and fish can b seen on this dive site; but there are some Parrot fishes, Nudibranchs, Double-headed Maori Wrasse, Damsel Fishes. By the wall corner are Fusiliers and at the end of the dive between the seagrass, the Net Pipe fish, Razorfish, Ghost Pipe fish and Seahorse. In shallow water are many Black and white Demoiselle fish. Interest : Most interesting at 10-20m. Not interesting below 30m. Depending on the current direction. Start the dive in front of the light house going east, slope on your right shoulder. Or your start at the north corner in front of Barangay beach going south-west, slope on the left shoulder. For more adventurous divers. Deep drop-off with a platform at 22mand 30m. it can have a strong current, watch the time table for proper entry time. Good night diving is at Barangay beach, see the on the map, easy to make a land entry and exit here, your dive profile is then a triangle. 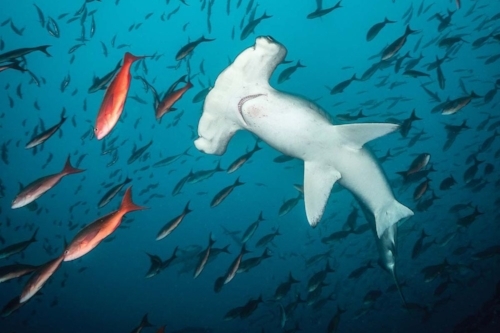 Until 1999 there was of Hammerhead sharks in March, now these days you have to be lucky. On the slope are Nudibranchs and try to find the Dragon fish or Seamoth. In deep water in the red sea-fans look for the small Pygmy seahorse. 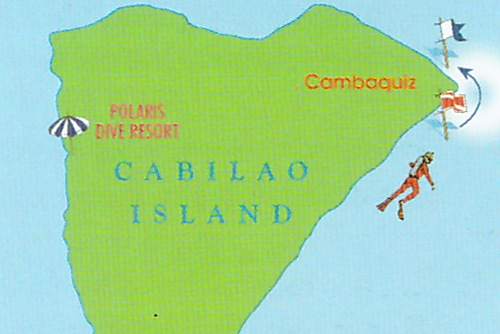 The local divemasters from Cabilao can show them to you. During the night-dive you see Conger eel like the ugly Marbled snake-eel. You safe stop is best above the seagrass in the shallow part. Interest : Most interesting at 8-15m. Not interesting below 30m. Dive Direction : Start the dive with the wall on the right shoulder going north, or left shoulder going south. To all dive operators and boat captains, please do not drop anchor on this side of the island there are very nice hard corals in this area. Start at 20-25m, go up to 12 and end at 5m. Beautiful steep wall with coral gardens. Great spot for a night dive. In the south from this dive site is a marine sanctuary, where, at the time of printing, it is not allowed to dive. Lots of small fish, seahorse in the shallow. Big sea fans along the wall and mackerels, young Barracudas and the Maori Wrasse. During the night dive for sure you will see some basket stars. Interest : Most interesting at 22-25m. not interesting below 30m. To all dive operators and boat captains, please do not drop anchor on this side of the island. There are very nice hard corals in this area. At the entry point is a big stick standing in the reef as a visual reference. Start at 22-25m’ look for the five caves, after that the wall s not straight but with corners where you dive through and around. Half way the dive ascends to 8-12m for the coral garden on the slope, which are the best on the island. Bring for this dive site a dive light to look inside the caves. Look in the small caves on the ceiling for the comet. The caves have sometimes small white tip shark, the slope with hard corals are the best among the island. Interest : Most interesting at 15m. Not interesting below 35m. Dive Direction : Start the dive with the wall on the left shoulder, going west. The entry point is a little bit further east from the concrete steps who are going into the water on the coast line. Bring dive light for this dive to look inside the small caves. On the wall are big gorgonians and ate the end of the dive nice corrals in the shallow part like big Basket sponges, Brown Daisy corrals and leather corrals. Often a school of striped fusiliers, Barracudas and raggy scorpion fish can also be seen. Interest : Most interesting at 10-15m. Not interesting below 30m. Depending on the current direction you can start in front of the diveshop from sea explorers going north with the wall on your right shoulder or you start in front of the light house going south with the wall on your left shoulder. Deep steep slope/wall right in front of the beach and the light house from Cabilao, Best moment for diving is in the afternoon when the sun is standing in the right angle. Beautiful corals and sea fans, lots of small fish like damsels, Moorish idols, butterfly fish, clown fish, Mackerels and fusiliers. Interest : Most interesting at 5-15m. Not interesting below 25m. To all dive operators and boat captains, please do not drop ancho on this side of the island there are very nice hard corals in this area. A little bit after the marine sanctuary in south direction comes this dive site. 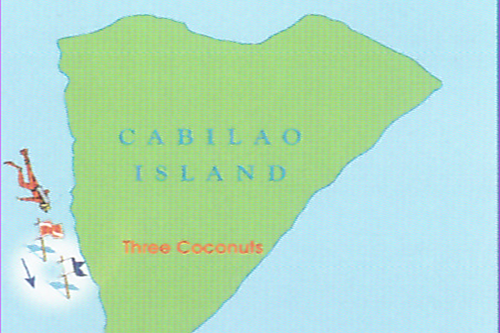 Why its called the tree coconuts is unclear because there are many coconut trees standing on this coastline. Great hard corals on the reef top especially at the end of the dive, some big Table corals can be seen here. For fish life you will see the Blue-finned Triggerfish, Mackerel, Purple Queen Anthias fish many Damsel fishes, young Barracudas, Rainbow Snappers and the Checkered Snapper.